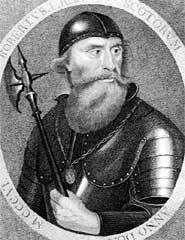 Robert I (11 July 1274 – 7 June 1329), often known as Robert the Bruce was King of Scots from 1306 until his death in 1329. His paternal ancestors were of Scoto-Norman heritage (originating in Brix, Manche, Normandy), and his maternal of Franco-Gaelic. He became one of Scotland's greatest kings, as well as one of the most famous warriors of his generation, eventually leading Scotland during the Wars of Scottish Independence against the Kingdom of England. He claimed the Scottish throne as a four-greats-grandson of David I of Scotland, and saw the recognition of Scotland as an independent nation during his reign. Bruce is remembered in Scotland today as a national hero.